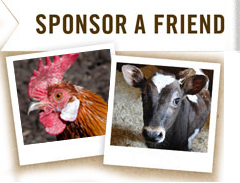 Good news: Your donation to Maple Farm Sanctuary may be tax deductible! You’re inspired to give because you want to provide lifelong homes for farmed animals, but did you know that you may also benefit financially from your generosity? Read on for three frequently asked questions about leveraging gifts to the Sanctuary to relieve a little of your tax burden. 1. When should I make my donation? Piggy Smalls says there’s no time to rest — make your gift today if you want to write it off this year! 2. I gave! How do I prove it? At Maple Farm Sanctuary, we’re happy to help out — in fact, if you donate $20 or more online, whether through our website or through GoFundMe, you’ll receive an acknowledgement letter in the mail. If you have a question about your receipt, an answer is just an email to giving@maplefarmsanctuary.org away. 3. How do I get my tax deduction? According to the IRS, you’ll need to itemize deductions on Form 1040, Schedule A in order to deduct your charitable contributions from your taxes. This video from TurboTax offers more insight into how to deduct your charitable contributions, and a certified accountant or tax professional will be able to answer your specific questions about donating. Habibi may not know any accountants to which she can refer you, but she does want you to know that we appreciate your gift! First developed in 1922 by Japanese Buddhist Mikao Usui, Reiki is a form of hands-on energy medicine that promotes emotional, mental, and spiritual well-being. Everything in the universe is made of energy, including the body, which is surrounded by energy fields or chakras. If the energy becomes blocked physically, emotionally, or mentally, over time it can lead to illness. Reiki is used to help the energy flow in a manner similar to acupuncture or acupressure and promotes healing by activating the relaxation response and helping the body achieve balance. In the past year, two very meaningful events related to reiki have completely transformed my life. The first was when I became certified as a Reiki Master. I chose to become certified because Reiki helped heal me physically, mentally, and spiritually, enabling me to become balanced and live an authentic life. The second major event was that I began volunteering at MFS, where I met more than 100 animals who had been abused, neglected, or unwanted. The love I felt from these animals was amazing, and decided to give back by sharing my Reiki expertise with them. Reiki for our animals can promote relaxation, self-healing, and balance, as well as heal trapped emotions from depression and anxiety. It can also benefit our many senior animals who suffer from arthritis and chronic pain. So far, I have practiced reiki on Gwen the turkey, Piggy Smalls the pot-bellied pig, Murphy the goat, and Konja the llama (pictured above). My most recent Reiki session was with Arlos the llama. The llamas at MFS tend to keep to themselves, spending as much time outside as possible. However, recently Arlos has been spending a lot of time inside the main barn and has even been approaching me. I realized this might be his way of letting me know that he would like some healing energy work! The first time I practiced Reiki on Arlos, he was laying down in the hay. I began my Reiki meditation ritual of intentions and symbols, making sure to ask permission from Arlos for our session. I then started the session by laying my hands on his lower back before working my way up to his shoulders, his neck, and his head. Working my way back down—his eyes began to close and I swear I saw a smile forming on his lips—I ended the session with my hands on both sides of his body, at which point he rolled over and showed me his belly. Generally, when animals show you their bellies, they are totally relaxed and trusting, so I took this as a good sign! I felt a special bond with Arlos that day, filled with the peaceful flowing energy, love, and compassion, which I was so fortunate to share with this beautiful animal. Combining my love for animals and my dedication to Reiki is a dream come true, and I look forwarding to using these two passions to help even more animals at MFS. Update 8/28: It is with heavy hearts that we report that one of our precious baby goats has passed away. Cheri noticed that he was having difficulty breathing, and after consulting with our vet, we determined that he had a congenital heart defect. We did everything we could to help him and make him feel better, but he sadly passed away on Sunday. Even though the little goat’s time with us was short, we showered him with love and affection, and he had many good days when he was able to run around with his siblings and bond with his mother. We are comforted by the fact that we gave him the best life possible while he was with us, and we are currently focusing on helping Wynvisa, who is grieving for her loss. We are still asking for help from the MFS community with naming our other new kids, but Cheri will be selecting a name for this boy as he was very close to her heart. Once you get to know the animals of Maple Farm Sanctuary as unique and special beings, it’s easy to forget that they were bred to be mere commodities. But sometimes, there’s a reminder, like when Gwen the turkey invites you to pet under her wing and you’re startled to feel a plump breast bioengineered for the Thanksgiving table. Or when the weather turns warm and Finn the Finnish cross sheep begins to pant under a wool coat thick enough to sink your hand into. Sheep were the first animal to be domesticated, first for food, and then for their wool. Primitive sheep like Bighorns shed most of their wool every year, but because of human interference, the majority of domestic sheep have to be shorn once a year to keep their coats in check. Finn’s coat grows quickly and sheep shearers are in demand in Massachusetts, so Cheri and Jim booked his appointment to be shorn months in advance. Aaron Loux of Aarons Shearing Service arrived in late June with his power shears and a gentle touch. Finn was skittish—it took Jim’s gentle coaxing before he would go toward Aaron—but he seemed to accept the shearing without a struggle. Aaron worked quickly and efficiently, often resting Finn against his body as he removed Finn’s coat. When it was over, Finn trotted out into the barnyard, away from the humans. Sheep can become self-conscious after they’re shorn and it usually takes Finn a couple of days to adjust to his new, sleek look. Aaron took great care with Finn, but typically, sheep shearing is brutal and traumatic for the animal. There’s no reason to support these practices when there are so many cruelty-free alternatives to wool. These include cotton, polyester fleece, synthetic shearling, Tencel, which is made from the eucalyptus tree; and Polar Fleece, which is made from recycled plastic bottles. As for Finn’s wool, Cheri and Jim are using it as a natural mulch for their vegetable garden. Watch the video of Finn's brave ordeal below! Maple Farm Sanctuary is undoubtedly a place of healing and hope for rescued animals—and it can also be a source of comfort and support for many of the people who visit. Recently MFS supporter Suzie Straughn came to the sanctuary during a time of personal hardship and turned her sorrow into an act of amazing generosity for the animals. Sadly, this past May, Suzie experienced her second pregnancy loss within six months. “At the time I was in a very low place, so my husband suggested visiting the sanctuary for their spring vegan potluck event,” says Suzie. At the potluck, Suzie listened as MFS co-founder Cheri shared her experiences transforming a dairy farm into a sanctuary and rescuing animals for over 20 years. Suzie was also able to meet many of the animals on a sanctuary tour, an experience she says helped her begin to mend. 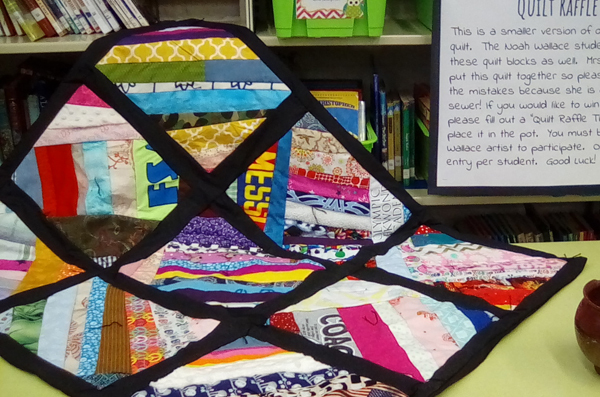 Suzie, an elementary and middle school art teacher, quickly found a way to channel that inspiration into action to make a difference for animals at the sanctuary through her school’s annual art show. She had students decorate ceramic plates that were bid on as part of silent auction—raising more than $800 for MFS! At the same time, Suzie noticed the large quantities of fresh fruit that were being thrown away each day by students at lunch. She worked with her school’s custodian to salvage 74 apples to feed the hungry animals at MFS. When students expressed interest in bringing in more food and items for the animals, she also had another idea. Suzie recently came back to MFS to take another tour and drop off of a large crate of apples as well as several boxes and bags of wish list items, including paper towels, bowls, and bottled water for volunteers. She was also able to reconnect with the animals and take pictures for her students, many of whom had never heard of a farm animal sanctuary or even the word “vegan” before. Suzie says she knows that veganism is a delicate topic to discuss with students and that she focused on conveying a message of kindness for all animals, a sentiment that Cheri readily endorses. For her part, Suzie will definitely return MFS. She is transferring to a new school in the fall but has already received permission to collect uneaten apples and carrots for the sanctuary on a regular basis. She also hopes to form a student club that will promote awareness of food waste and become further involved with MFS. Inspired by Suzie's compassionate example, MFS is seeking to connect with other local schools that have extra produce on hand. If your school has uneaten apples, carrots, and other fruits and veggies that you can donate to MFS, please email jenw@maplefarmsanctuary.org. The hope is to raise awareness about the poor quality of life that circus animals lead. The Kelly Miller circus has a long history of animal cruelty, including reports of a handler striking an elephant with a bull hook so hard she screamed, and other animals being confined to tiny cages in which they can barely move. 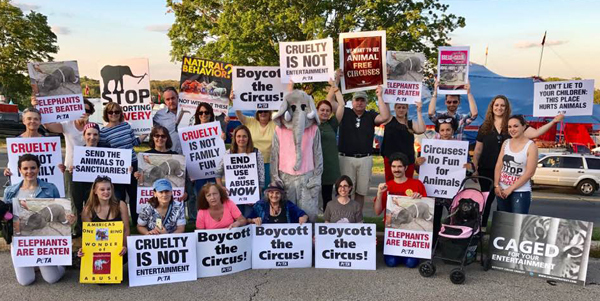 MFS hopes to see traveling circuses like Kelly Miller follow the lead of Ringling Brothers and Barnum & Bailey Circus, which in May, closed shop for good after nearly 100 years in business. It’s been an exciting tour season at MFS so far. We’ve already welcomed more than 300 visitors, and on July 8, we were the last stop on a vegan cruise itinerary! The tour participants, who came from as far away as California, had spent the week travelling from Montreal to Boston on Holland America’s ms Veendam. They were part of an onboard vegan cruise group organized by Vegan Cruise Planners, a boutique travel agency run by Curtis and Franci Kettman. Curtis says he felt it was important to visit MFS to enable group members to experience connections with farm animals and to reinforce their vegan lifestyles, a feat that was also easy to carry out on the cruise—we’re told that group members enjoyed perks including a private vegan breakfast, exclusive vegan dinner menu, and vegan ice cream social! We don’t know when the next vegan cruise will dock near MFS— Vegan Cruise Planners likes to visit different destinations each year, including upcoming trips to the Mexican Riviera and the Mediterranean Sea—but they are most certainly welcome back any time. MFS offers public tours on Saturdays and Sundays in May-Oct. We also run private tours for groups. 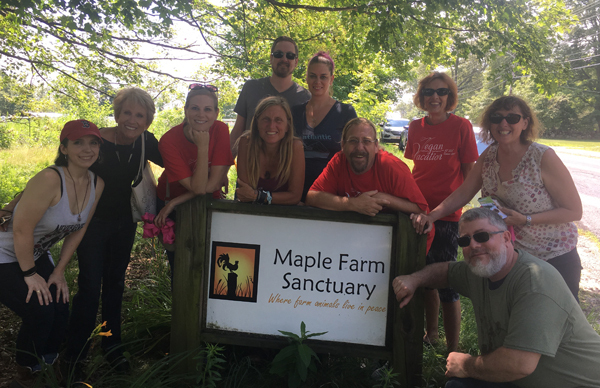 If you are part of a travel agency and would like to include our fun, inspiring, and compassionate tour as an activity, email us at tours@maplefarmsanctuary.org. Looking for a decadent vegan cheese that's easy to make? Raw food chef Jess Rice—a Massachusetts native who is making waves in vegan cooking in Tennessee and around the world—kindly shared this raw tree nut cheese recipe with MFS. We think it's perfect for spreading on your favorite crackers, pairing with a delicious vegan wine, or sharing with others at a potluck! Stay tuned for additional recipes from Jess in upcoming MFS newsletters. Blend soaked nuts, water, and probiotics in a high-speed blender until completely smooth. Stop blender periodically and, with your spatula, scrape down the sides of the blender to make sure all the nuts are blended smooth. Spoon mixture into your nut milk bag or cheese cloth and tie it off. Check your cheese after 24 hours. If it’s starting to smell a little sour, it’s done! If it still smells bland, leave it for up to 48 hours total, continuing to check it periodically. Once fermented, transfer the cheese to a clean mixing bowl and add nutritional yeast, lemon juice, and salt to taste. Experiment with different herbs and seasonings to achieve whatever kind of cheese you’re craving. Omit the nutritional yeast for goat-style cheese. Spoon the flavored cheese onto wax paper (or cheese mold) and form into a wheel or log with your spatula. Wrap with wax paper and place it in the freezer for 1-2 weeks to age and set. If you’re making a cheddar-style cheese, place the uncovered (frozen) wheel in the dehydrator for 12‐36 hours to get a rind, then refrigerate until ready to serve. Goat-style cheese should be served soft and creamy, so don’t dehydrate. My name is Jess Rice and I am a raw vegan chef. I am based in Nashville, TN, but I grew up in Medway, MA. I am the former owner of Avo, Nashville's first raw vegan dining concept. I was the creative director, GM and chef de cuisine before selling my equity to my financial partner in February of last year. Since selling Avo, I have toured with Neil Young as his personal chef. I worked with his team on the road, cooking mainly on a tour bus. I have also worked for Kelly Clarkson, giving her private vegan cooking lessons in her home in 2015. Additionally, I have also cooked for Miley Cyrus, Wayne Coyne, Coty Sensebaugh (Tennessee Titans player) and Carrie Underwood. Currently, I am working with a family of 6 in their home as their private chef in Brentwood, TN. I have been throwing sold out pop up dinners all over Nashville for the past 2 years. My specialty is fresh, raw, vegan cuisine, but I am able to work with whatever ingredients my clients request as long as it is 100% plant-based. While I was at the helm of the kitchen at Avo, my restaurant won "Best Vegetarian" and "Best New Restaurant" in the Nashville Scene in 2015. In 2016, my raw vegan cheesecake was voted "Best Dessert" in the Nashville Scene. I was named one of Nashville's "Most Beautiful People" in Nashville Lifestyles Magazine in 2015 and I was recently named one of the country's "Hottest Plant-based Chefs" in Thrive Magazine. I was given the honor of being the keynote speaker at the 2016 Nashville VegFest (an event that drew over 4,000 people) and I am booked to speak and demo original recipes at the Southern Women's Show on two separate days later this month in Nashville at Music City Center. I teach holistic nutrition and healthy cooking classes in Nashville and on retreats. I have prepared gourmet plant-based foods in Indonesia, Australia, and all over the U.S.A. My formal training took place in Ubud with Naturopath Dr. Amy Rachelle and in Santa Monica and Culver City, under the watchful eyes of celebrated plant-based chefs Matthew Kenney and Scott Winegard in California. More information on Jess and her recipes can be found at My Poor Tired Liver.